Need a super easy (and healthy!) side dish for dinner? 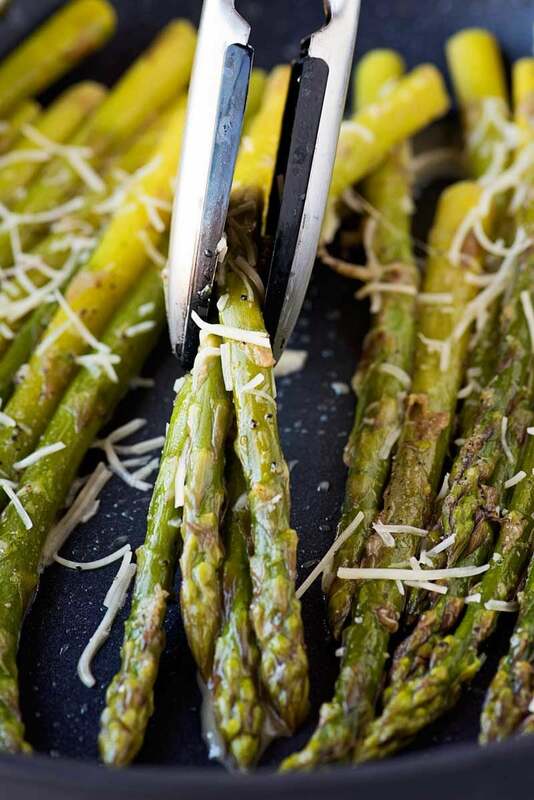 This parmesan asparagus is perfect! 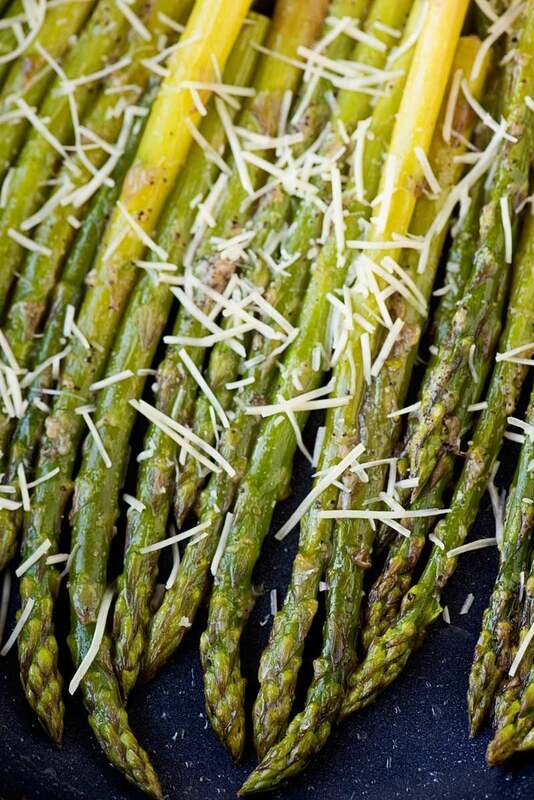 Tender asparagus with hints of garlic and shredded parmesan. I know this is going to sound crazy, but I can’t tell you how glad I am that it’s Tuesday. I promise I’m not normally one of “those” early-week people (seriously, is there anyone who truly is? And admits it?) but it’s been quite a busy week in my little corner of the world. I’ll spare you all the details (hint: it’s boring work-related website stuff) but all that official blogger business means that I haven’t had that much time left over to indulge myself with food. And while that’s good news for my self-imposed questionably-existant diet, it’s a bit problematic when you’re primary goal in life is to share indulgent food. What’s a food blog to do when it needs drool-worthy eats for content but doesn’t have a lot of time (or mental power) to do deliver? I’ll tell you what: this food blogger super-charges her recipe search to only include those that are easy and fast. Honestly, I wish every recipe had those qualities, but alas, sometimes you just need to roll up your sleeves and get to work. As busy and as stressful as it’s been, I love the fact that I had a good excuse this week to cut a few corners. I also surprised myself a bit, since I specifically started to research “easy asparagus” recipes… even though I can’t remember the last time I ate asparagus. Somehow asparagus has become the poster child for “healthy eats” in my mind, though I’d never be able to tell you how it got that way. Maybe all the gorgeous food photos on Pinterest have been sending me subliminal messages. So, what did my searches come up with? A recipe for 10 minute asparagus that I already had all the ingredients for… well, except for the asparagus. But, thankfully, one trip to the grocery store fixed that. I was out of milk, anyway, so I took out two birds. I made sure to confirm the cook time on this (since I had to get back to work) – it really was ready in 10 minutes, if not a minute or two to spare. Couldn’t have been more perfect for my cross-eyed, sleep-deprived, desperately-hungry state from being work weary. The fact that it was surprisingly delicious for so few ingredients (and calories!) was a definite plus. This post was originally published on November 10, 2014. It was updated with new pictures and revised recipe instructions on March 11th, 2017. Chop off the woody ends of the asparagus (roughly 1-2 inches). 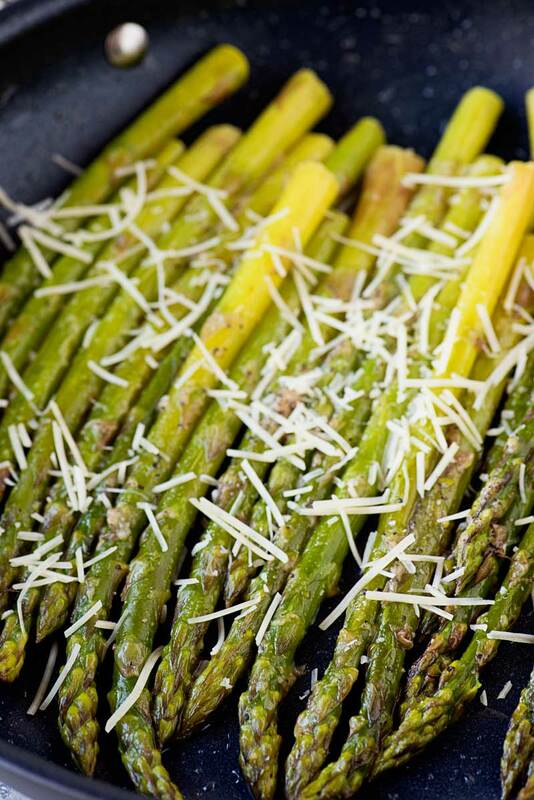 Place an even layer of asparagus in a pan wide enough so that the ends do not bend, such as a large skillet. It's okay if asparagus overlaps a little bit. Add water to skillet and cover. Cook on high for 4-6 minutes, until asparagus is tender but still firm. Halfway through cooking time, gently shake the asparagus back and forth. Drain the water from the skillet and place the asparagus back inside. 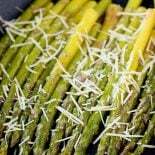 Sprinkle garlic salt and 2 tablespoons of parmesan cheese on top of asparagus, then add the butter in the middle of the asparagus. Saute on medium heat until butter is melted and cheese is gooey and lightly browned. Remove asparagus from heat. 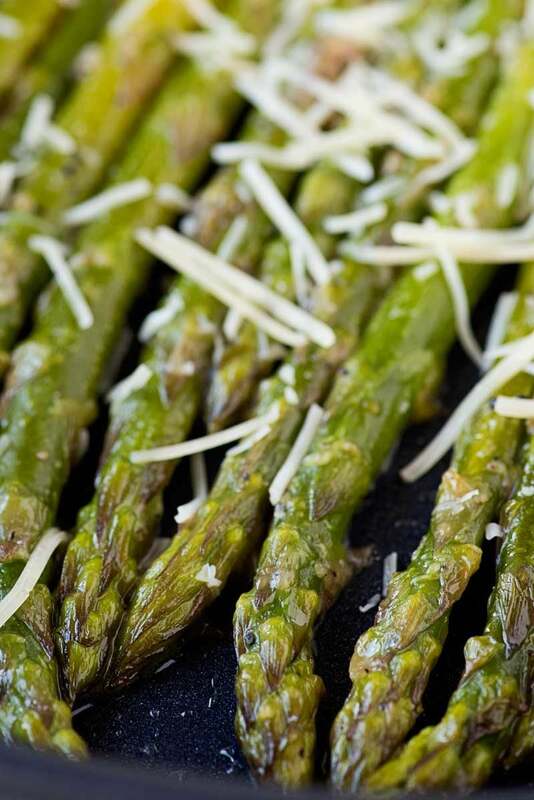 Sprinkle remaining parmesan cheese on top of asparagus. Serve immediately. Recipe adapted from Ella Claire.